In 2017, Juana Melara became the face of the #MeToo movement for domestic workers across the country. She broke the silence with her story on the sexual harassment she endured in the workplace, which is extremely prevalent among vulnerable, female workers in the hotel industry. As a result of her courage in speaking out, she became Time magazine’s Person of the Year, along with an array of silence breakers, for her activism. Yesterday, Juana took to Sacramento to advocate for the passage of two bills critical to protecting women in all industries from sexual harassment. As a hotel housekeeper, UNITE HERE! member, and activist, Juana advocated for legislators to support AB 3080 (Gonzalez Fletcher), a bill protecting workers by ensuring no one is forced to sign away her rights on the job, alongside AB 1761(Muratsuchi), which provides panic buttons for domestic workers who are especially vulnerable to sexual assault. .
As a result of the overwhelming support from silence breakers Juana Melara, Gretchen Carlson, Susan Fowler, and Sandra Pezqueda, AB 3080 (Gonzalez Fletcher), a bill sponsored by the California Labor Federation, passed on the assembly floor today, a huge victory for working people throughout the state. Forced arbitration, which disproportionately impacts women and people of color, has been used to coerce and exploit workers for years. Companies force their employees to sign away their rights and abandon any pathway to justice in the face of worker abuse. 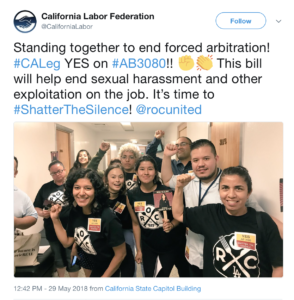 The clauses routinely silence employees who have been mistreated and harassed on the job, which makes passing AB 3080 (Gonzalez Fletcher) all the more important. Today’s victory in the Assembly is a great first step to ensuring workers will no longer be required to sign away their rights just to get a job. In the wake up the #MeToo movement, both AB 3080 and AB 1761 are setting the tone for real, lasting action to by the legislature to take on sexual harassment and abuse. Workers are standing together to shift the power balance. As Juana and the other silence breakers make clear, when we stand together, there’s no limit to what we can achieve. Join the many women standing together to end forced arbitration on the job! Take action to urge the California Legislature to pass this vital legislation!